£15.00 for the day. For free registration see below. Thematically framed by the broad aims of the main conference – Pictures of War: The Still Image in Conflict since 1945 – the Masterclass aims to provide a supportive environment for students to engage in critical, reflexive thinking and to develop their methodological approaches to visual material. With a focus on interdisciplinarity, the event seeks to foreground how applied visual methods and the discussion of, can help to enhance, produce or support ongoing research in the humanities regionally, nationally and potentially internationally. Led by a team of experts in their respective fields, the day will commence with a panel session discussing the varied methods and approaches related to the analysis of conflict related imagery, their production, circulation, consumption and effect. Dr Gary Bratchford, Chair of the Visual Culture Research Group and Senior Lecturer in Photography, The University of Central Lancashire, in collaboration with Manchester Metropolitan University. Professor Ana Carden-Coyne. Director of the Centre for the Cultural History of War (CCHW) in the School of Arts, Histories and Cultures, University of Manchester. Dr Aidan McGarry. Reader in Politics at the University of Brighton. Dr Simon Faulkner. Senior Lecturer in Art History, Manchester School of Art. Professor Farida Vis. Director of the Visual Social Media Lab and Professor of Media at Manchester School of Art. Capacity will be limited to 45 students. A limited, free registration for Conference attendance will be available on a first come first serve basis (see deadline below) on receipt of a rationale for your participation in the Masterclass. Short text (max 250 words) describing the relation of your research to the conference themes. Notification of successful applications will be made the week commencing 2nd April 2018. 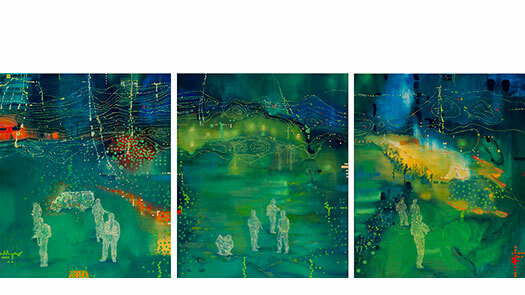 Image credit: Jon Cattapan, Night Figures (Gleno), 2009, oil and acrylic on linen.